The Beloved Racial Justice Ministry Team’s mission is to create a beloved and just multiracial community within East Shore Unitarian Church and in the wider world by acting to address racial justice issues. We honor the worth and dignity of every human being and the interconnected web of all of life by recognizing prejudice, privilege and injustice. We seek to dismantle prejudice, unfair privilege and injustice in ourselves, our church and our community. In order to build a caring religious community, we seek to create a racially inclusive church community. This work grows our souls through increased understanding and humility and through actions to increase peace and justice. 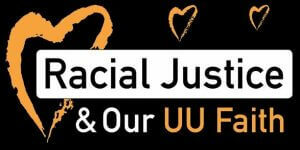 We are in alignment with Unitarian Universalist Association (UUA) key initiatives around multiculturalism and racial justice. Education: More than 80 Church members have participated in the eight-week Beloved Conversations curriculum (offered 5 times so far). Ten church members also attended training in Restorative Justice practices through the Seattle Restorative Justice organization (January and April 2016). Forums: Dialogue on Juvenile Detention (April 2016) and Dialogue on Juvenile Detention Center (June 2016). White People Talk About Race – Periodic discussion group that focuses on racial topics particularly difficult for white people. Public Witness: Since July 2015, Church members have participated in monthly Black Lives Matter Flash Stance public demonstrations in Bellevue, Issaquah, Kirkland and Woodinville. Church members also participate in community wide demonstrations to fight racism and oppression. Traces of Trade documentary with special guest Tom DeWolf. UUA General Assembly Ware Lectures Series: Van Jones (03/18), Winona La Duke (04/18) and Brittany Packnett (06/18). The New Jim Crowby Michelle Alexander (2016). East Shore members collected signatures to put the I-940 De-Escalate Washington initiative on the 2018 ballot. The measure will require law enforcement to receive violence de-escalation, mental-health, and first-aid training, and to provide first-aid. It will change standards for use of deadly force, adding a “good faith” standard and independent investigation. Collaborations: East Shore and the Pacific Northwest UU Justice Network sponsored an Anti-Racist Activists networking event in December 2017. The conference drew UUs from 5 area churches and included members of other faith traditions that work on racial justice. Climate Solutions – What You Can Do?